We are engaged in offering the best Containerized Movement of Cargo services to our clients by providing customized containers based on the size and type of cargo. Our warehouse is completely equipped to provide such facilities to customers. We are known to be the best in the domain as we ensure that the job accepted is completed to the highest level of satisfaction of our customers. NRL, being a local container movement company, understand our responsibilities of pickup and delivery of cargo from anywhere, anytime at zero damage. Our consistent effort and dedication has helped us build trust and long term relationship with traders and other customers. We are nationalized logistics service providers with more trending towards container movements. We have carved a specialized standing for ourselves in the market by offering to our patrons a top class assortment of Loaded Container Transportation. Applauded owing to their timely delivery, reliability and effectiveness, these presented services are widely recommended. Besides this, our ability to modify these as per the changed needs of our customers has made us a popular market choice. These transportation services are carried out by the experts using the travel medium of air, sea or road in the most efficient manner. Are you looking for speedy, economical, securecargo movement in your area or anywhere in India? Need not give a second thought. Integrated, intermodal and break bulk cargo container movement. Safe and timely transfer of packaged goods. Our foster workforce has rich domain knowledge. Loading and unloading with utmost care is done. Pickup and delivery of cargo at customer’s doorstep. Labors are under observation till the last point. For the movement of conventional dry cargo, extra volumetric capacity, light but bulky cargo, movement of refrigerated/perishable cargo. Focus is lower transportation costs and improve the vehicle routing. Starting from picking containers from anchor, transporting to customers site and put back unloaded, vacant container back to anchor. For containers movement special features like plug points, portable clip for movements of trailer power packs for train movements etc. Intermodal transfers in economically large units between chassis, road, rail and flatboat using a minimum of labor. Containerized movement of good might be intermodal (freight movement from one mode of transportation to another) or trans modal (freight movement within same mode of transport). Our annual throughput is around 1,50,0000 TEU. 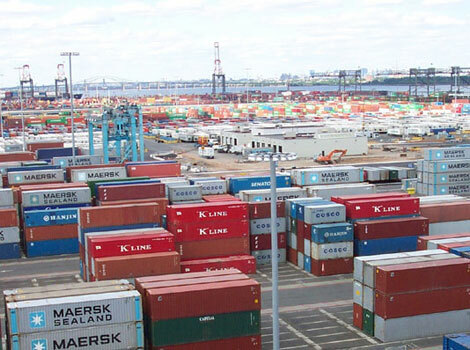 Containerization is a system of intermodal freight transport using intermodal containers (also called shipping containers and ISO containers) made of weathering steel. The containers have standardized dimensions. They can be loaded and unloaded, stacked, transported efficiently over long distances, and transferred from one mode of transport to another—container ships, rail transport flatcars, and semi-trailer trucks—without being opened. The handling system is completely mechanized so that all handling is done with cranes and special forklift trucks. All containers are numbered and tracked using computerized systems.